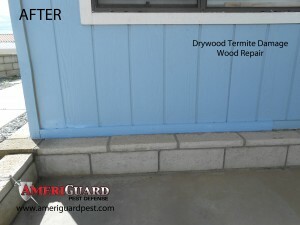 Drywood termites feed on dry wood materials often infesting structural timbers and other woodwork in buildings. Drywood termites chew across the grain of wood, creating hollowed out galleries and threatening the structural integrity of wood members. After the termites have been eliminated from the structure, the damaged wood members will need to be restored to ensure your safety. 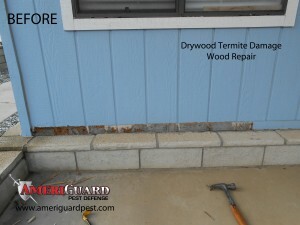 We offer full wood repair services for any termite treatments or fumigations we perform. 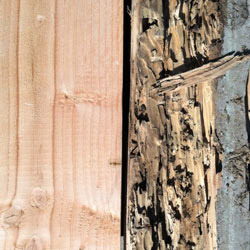 AmeriGuard Pest Defense has an in-house wood repair crew with construction experience. Our team is able to ready to restore the beauty of your home or office. Our team of wood repair experts can tackle any structural termite repair as well as restore your home to its original condition. After the construction has been completed, our wood repair team will focus on restoring damaged stucco and painting the exposed surfaces to make your home look like new.